Shop sale at Barbeques Galore to save up to 60% off top grills and accessories. Enjoy up to 50% off grills and smokers from Barbeques Galore. Act now and get your grill shipped for just $49 flat rate from Barbeques Galore online. Shop for patio furniture online at BBQGalore.com to save up to 30% on top brands. 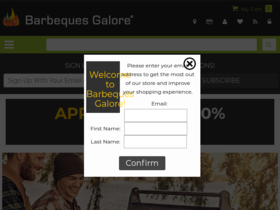 Check out BBQ Galore online for their latest special offers.